But this doesn’t have to be the high point of the summer for the Blues, writes Ciarán Murphy. 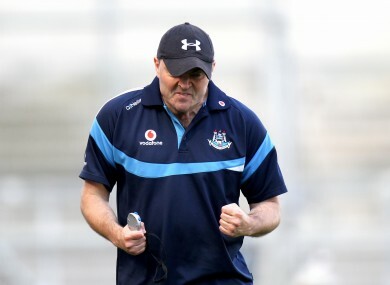 Dublin boss celebrates a late score. THERE ARE A number of ways to be surprised at the fact that this morning, Dublin wake up as Leinster champions. You can take yourself back 15 years and look at where Dublin hurling was then, before the string of underage successes of recent times, and try and imagine it. Or alternatively, you can take yourself back five weeks, when after that draw against Wexford in the first round, and despite all those seemingly significant minor and U-21 wins, senior success looked as far away as ever. What has happened in the last month and a bit for Anthony Daly and his team has been extraordinary. They looked out of love with the game that day in Wexford Park – like their very hurling existence was a weight across their shoulders. They survived that night, but they looked like they were going nowhere, that nothing had changed from last year when they collapsed under the weight of expectation going into that Leinster semi-final against Kilkenny. You don’t beat Kilkenny in replays, and yet Dublin did it. And the shot of belief that gave this team took them over the line yesterday, when they could have started to wobble after Galway’s second goal. They played with physicality, with heart and with pace – and Galway just had no answer. In places like Tipperary and Waterford they would say that the football team is for the lads who weren’t good enough to make the hurling team. Eoin Cadogan broke a century of tradition when he picked the footballers over the hurlers in Cork this year. Footballers and hurlers are kept apart, like horny teenagers at the Gaeltacht, in Galway and Clare. But in Dublin the hurlers live cheek by jowl with the footballers, and they have to live with their second class status every day of the week. It’s hard to listen to the Dublin fans singing and think of them as supporting the underdogs, but that’s what yesterday was about – it was a day when the hurlers got to stand underneath the Hill and celebrate a win that had been a long time coming. And even though he had been there plenty of times before, celebrating provincial titles, I was particularly delighted for Conal Keaney. He and Shane Ryan have probably been the most high-profile hurlers in Dublin for the last 10 years, and that’s because they’re footballers. But that was some statement of intent in 2011 when Keaney decided to put football on the back burner. He had won five Leinster football titles, and walked away from a team that would go on and win the All-Ireland later that year… but hurling was his sport. And while he was a fine footballer, he’s an exceptional hurler. He had to make a choice between being a winner, and being a hurler — and now he’s both. For Galway it was a very chastening afternoon. They will look back at a couple of key moments – Joe Canning’s goal chance in the 64th minute when there was only six in it, a couple of points directly after the goals that were really gifted to Dublin… but they never got themselves into a position to really ask the winners the testing questions. It would only have been natural for Dublin to start wavering so close to the finish line, but once it became clear that Galway were incapable of landing the decisive blow, they really pushed for home and poured it on in the last few minutes. And even if Galway had managed to stage a miraculous recovery, huge questions still remain. Both midfielders were taken off by half-time, as was one of the main men last year, Cyril Donnellan. The full-back line was under severe pressure throughout, and our half-forward line was annihilated under the high ball. It was the second time this summer I’ve seen Galway being beaten by 10 points or more, and it’s not a lot of fun. But losing to the Dubs is certainly far preferable than losing to Mayo at home in the Connacht championship, or Kilkenny in an All-Ireland final replay for that matter. This is a win for everyone to celebrate. And despite the elemental nature of Kilkenny’s win over Tipperary on Saturday night, this All-Ireland championship is more open than any we’ve had in the last 15 years. Dublin need to adjust to THAT new reality now too today. This need not be the highpoint. Email “Murph's Sideline Cut: Daly's Dubs have come a long way, baby”. Feedback on “Murph's Sideline Cut: Daly's Dubs have come a long way, baby”.